Hugo Boss. Glam designer. Edgy and elegant, classically sophisticated clothes, purity of line and color. But the fashion icon has other faces. One such face is Emily Jacir. A multimedia conceptual artist, Jacir is the 2008 and seventh recipient of the Hugo Boss Prize; an exhibit of her work, awarded to her upon her win, debuted at the Guggenheim in February 2009. Her work is provocative, polemical, and disturbing. Her signature piece recaps the assassination of a Palestinian intellectual in 1971. Using photography, performance and video, Jacir’s multimedia “installations” use space and materials in original, radical ways. Hugo Boss’s art sponsorship program dates back to 1996, most notably with the grant now internationally recognized as the Hugo Boss Prize. 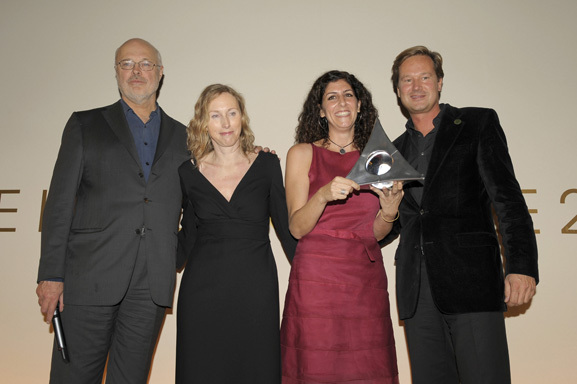 Now an art-world institution, the award rewards outstanding achievement in contemporary art. Administered by the Guggenheim Foundation in concert with an international jury of museum curators and directors, the annual prize presents a stipend of $100,000 as well as a solo exhibit at the Guggenheim to one deserving winner each year, bestowing international recognition to emerging artists. What’s striking about the work of Jacir and previous prize recipients is its intellectual, cerebral nature. Sometimes delivered as partly political commentary, the exhibits provoke us to look at the past—and present—through another lens. Also notable is the integration of other artists, including actors and literary critics. While the Guggenheim and its international team of art specialists are the final say on award recipients, Hugo Boss’ prize and art sponsorship programs are the result of a behind-the-scenes role at the fashion designer’s European headquarters in Metzingen, Germany. Hjördis Kettenbach, head of cultural affairs, has lead the international arts program at Hugo Boss for more than 10 years and has helped shape the direction of the awards and other programs. An art scholar with a Ph.D. in art history, Kettenbach asserts the task of developing the program was a challenge. “For me, this was a big challenge from day one, since I effectively had to start from scratch,” she says. She is proud of heading cultural affairs at one of the few fashion companies with serious and ongoing art programs. “In our opinion, continuity and sincerity are the Hugo Boss Prize’s keys to success,” she reveals. Aside from the generous Hugo Boss Prize, the company also sponsors the German Pavilion at the Biennale in Venice and co-sponsors the Berlin International Film Festival.